Friday afternoon kicked off rivalry weekend in college football. It was a beautiful November day in the city of Pittsburgh, Pennsylvania and for the University of Pittsburgh, the day was about to become even more beautiful before sunset. The 4 win and 7 loss Panthers led by true freshman quarterback Kenny Pickett dawning the number eight in only his second start of the season engineered the Panthers to a 24-14 upset victory over nationally ranked Miami. The Pitt win was the first loss of the season for the Hurricane who came into the game with a record of 10 wins against no losses and this season the U has become infamously known as the owners of the “Turn-over” Chain. That is a huge gold chain with the “U” in the middle of it and it is given to a defensive player after he makes the opponent commit a turnover. In this game, there were only two Pitt Miscues and both of those came in the first half. 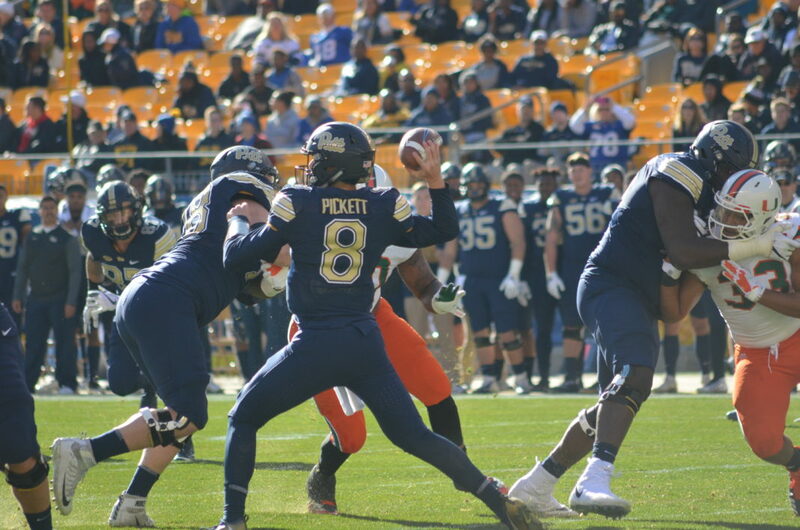 Coach Pat Narduzzis’ freshman Quarterback scored the Panthers first TD of the day as Pitt put an end to the longest active FBS ( Football Bowl Sub-Division ) winning streak at 15 games. Pickett finished with two Tds on the day, his initial score took place in the second quarter with the Panthers down 7-3. The freshman capped a Pitt 12 play 75-yard drive flipping into the end zone at the end of a six-yard run. The Touchdown was the first of 21 straight points the Panthers would score before Miami would see the end zone again. After the intermission, Pickett went right to work connecting with Q Ollison on a 5 yd TD pass to Ollison capping a 9 play 65-yard drive on what would turn out to be the only scoring done in the third quarter. Then in the fourth quarter up 17-7 with just under three minutes left in the game, Pickett scampered into the end zone for his second touchdown on the day after gobbling up 22 yards on a quarterback keeper. That put the Panthers up 24 to 7 before the Hurricane answered with a 39 yard TD toss as the Canes QB Malik Rosier connected with Braxton Berrios. When the smoke cleared in this battle Pickett had guided the Panthers to the upset as Pittsburgh used balanced offense with 192 yards passing and 152 yards rushing to rack up a total of 344 yards. The Panthers D which was led by Oluwaseun Idowu and his eight tackles held the Hurricanes to 171 yards passing and only 41 yards on the ground. Meanwhile, Pickett finished the day connecting 18 times on his 29 passing attempts for 193 yards and he ran the ball 13 times for 60 yards and two scores.